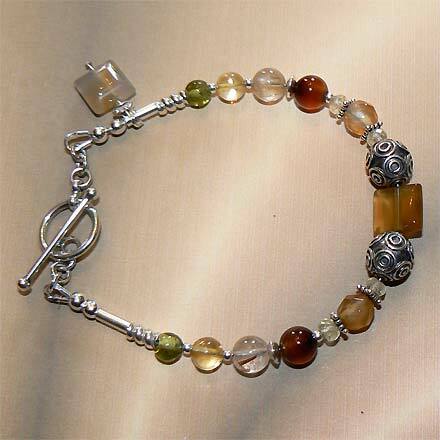 Sterling Silver Carnelian, Golden and Lemon Citrine, Rutilated Quartz and Peridot Bracelet. 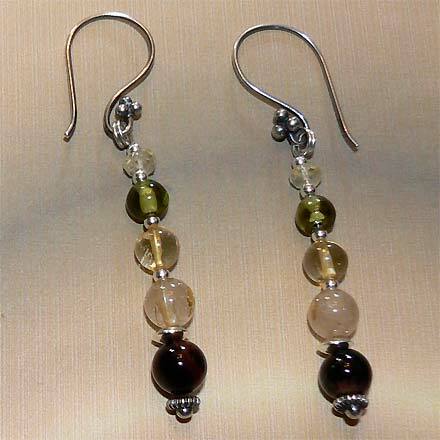 Sterling Silver Carnelian, Golden and Lemon Citrine, Rutilated Quartz and Peridot Earrings. So many different transparent colors of in the gold spectrum! Two types of Citrine (Golden and Lemon), Peridot and Rutilated Quartz embellish the main stone, Carnelian, which comes in honey, light orange and dark brownish red. The pendant is like a miniature abstract sculpture...I've never seen anything like it! For those who are interested in Astrological significances of stones, Carnelian and Quartz correspond with Taurus, Citrine is November's birthstone, and Peridot corresponds with Libra and with the month of August.